How can we allow ourselves to be welcomed by those who seem most different from us, in order to create bonds of friendship and solidarity, even when past relationships have been marked by exploitation, violence and mistrust? As an attempt to give a lived-out answer to this question, a stage in the pilgrimage of trust was held from May 24-27 at Red Shirt Table, on the Pine Ridge Lakota Indian Reservation in South Dakota (USA). The weekend brought together over 500 pilgrims from throughout North America, and others from as far away as Finland, Germany, France and Austria, who were joined by many Native Americans and other local people. 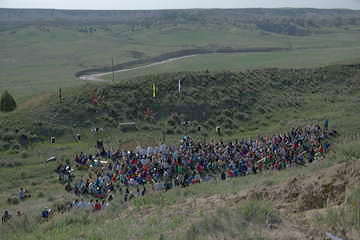 All the seven Indian reservations in the State of South Dakota were represented. 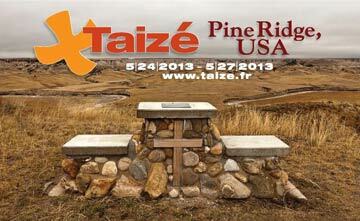 The Pine Ridge gathering was the result of several years of reciprocal visits between South Dakota and Taizé. Last December, a large group of native and non-native youth came to the European meeting in Rome. 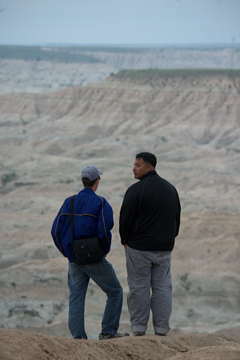 Gradually, trust was built and the dream of organizing something on the Pine Ridge reservation became a reality. The Two Bulls family in Red Shirt offered to welcome pilgrims to their home. 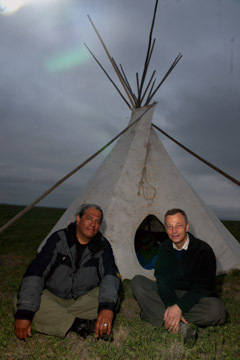 In April, two brothers went to the reservation to live and were then joined by others. 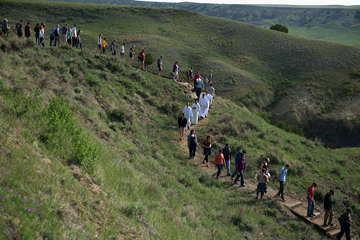 In early May, three teams of brothers and young people undertook a pilgrimage throughout the state, visiting churches both on reservations and in cities for evenings of prayer and reflection. Preparations for the meeting brought together different denominations and churches. The Episcopal Church has historically been very present on the reservation and in ministry with the Lakota, and without the spiritual and material support of the diocese and its bishop the meeting would not have been possible. The brothers were offered warm hospitality by a community of Jesuit priests who run a school at Red Cloud, and the Catholic bishop of Rapid City attended part of the meeting. Lutheran and Presbyterian retreat centers, as well as a small non-denominational community in Rapid City, helped house volunteers during the time preceding the meeting. A host of churches, families and individuals gave generously of their time and energy to make the gathering possible. The hope is that the relationships created will continue in the coming months and years; already a group from the area is planning a return visit to Taizé. For another report on the meeting, see the article here on the Episcopal News Service.